A classic cool and creamy hummus recipe is delicious enough to dip into, but with a few simple bells and whistles added in, it can be turned into a rich and creamy roasted garlic hummus that packs a ton of flavor, perfect for dipping or spreading. The classic hummus is favorite creamy dip of Middle Eastern origin made from protein-packed and fiber-rich chickpeas whirled together until smooth and creamy with a touch of garlic, lemon, tahini and olive oil, plus a few pinches of spice. It’s the perfect flavorful dip to enjoy with pita bread, lavash or fresh vegetables, making for a simple and delicious option to serve as a snack or appetizer that’s both filling and good for you. 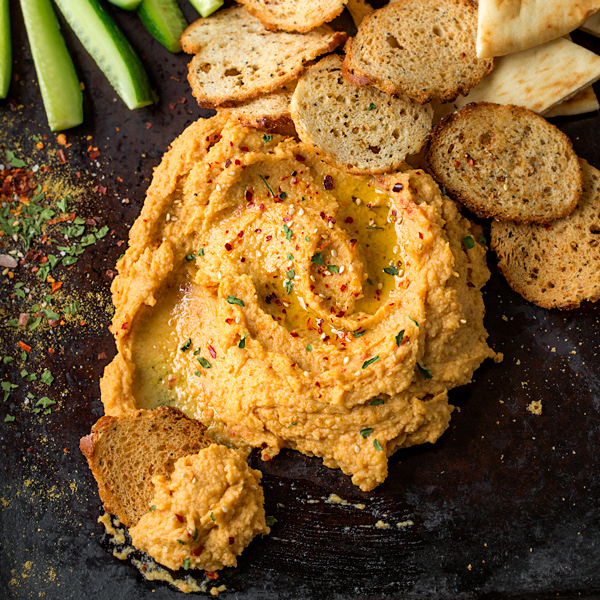 Homemade hummus is an ideal candidate to get creative with since the sky’s the limit when it comes to adding savory flavors. And getting creative is what adds a little “flavor surprise” to an already simple yet delectable dip, taking it to the next level. 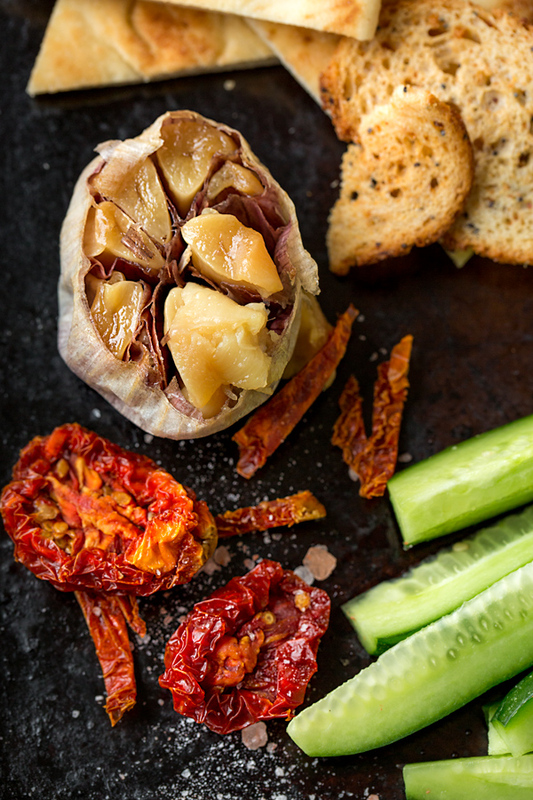 Roasted garlic provides a subtle sweetness over the traditional raw garlic cloves. The colorful surprise of a few sun-dried tomatoes offer just a little speckle of added color and tanginess, which pairs wonderfully with a hint of warm spice at the end. What you get is roasted garlic hummus with a bit of a surprise kick to it, yet with all of that classic smooth and creamy texture that makes it so irresistibly scoop-able in the first place. Simply add your canned chickpeas (or garbanzo beans) to a food processor, along with your roasted garlic, sun-dried tomato and other remaining ingredients, and blend together until smooth. 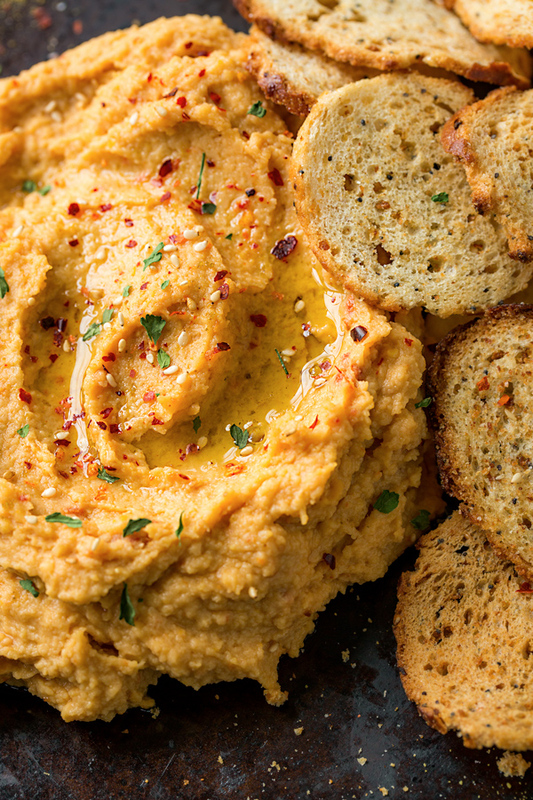 Top with a finishing drizzle of olive oil, plus a sprinkle of ground cumin and paprika for added warmth and color, and you have a freshly-prepared and scrumptious homemade hummus to serve up with warm wedges of pita bread, or your favorite accoutrements. Far better than store bought, it’s a healthy yet satisfying snack or appetizer that one can feel good about eating, and who doesn’t love that? 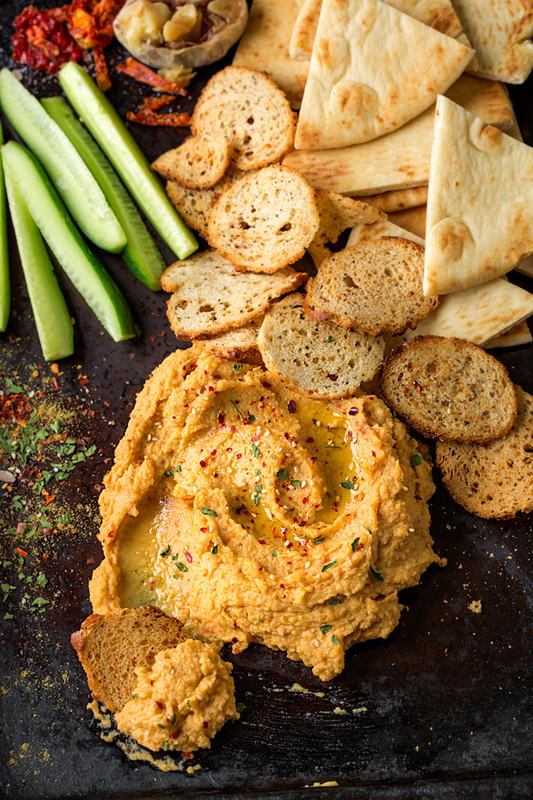 Make ahead: Hummus is an ideal snack to make ahead and keep in a covered bowl/container in the fridge. Just add the garnishes when ready to serve. It should be nice and fresh for about 2-3 days. Get creative with your garnishes: You can substitute some harissa for the paprika if you’d like a little more kick, and you could even use some dried, minced onion or garlic as a topper—whatever sounds good to you and offers a bit of texture and flavor at the end. What is tahini and where to find it? Tahini is a paste that is made from ground sesames seeds, and can typically be found in the International Foods isle, or even with other nut butters. If you can’t find it, feel free to leave it out all together. 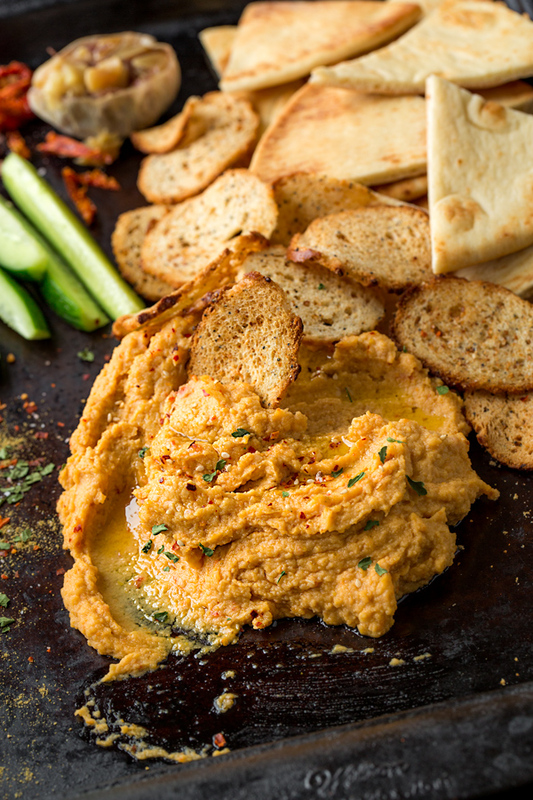 Smooth and creamy with a warming and mildly spicy kick, this hummus is rich with the sweet and savory flavor of roasted garlic and a hint of sun-dried tomato for delectable dipping. -Preheat the oven to 400°, and prepare 3 small squares of foil. -Cut the tops off the heads of garlic, exposing the cloves a little; drizzle with a touch of oil and sprinkle with a touch of salt for added flavor, and wrap each head in a square of foil; place onto a small baking sheet and roast for about 40 minutes, until the garlic is tender and sweet; allow to cool, then squeeze the softened garlic out the papers. -Place the chickpeas into the bowl of a food processor, along with the roasted garlic cloves, plus the remainder of the ingredients up to and including the Greek yogurt, and process until smooth; with the processor running, drizzle in the olive oil until well-incorporated. -Spoon the hummus into a large bowl or serving platter and drizzle with a little olive oil; sprinkle over a little of the dried parsley, the sesame seeds, the cumin and the paprika, and serve with pita wedges, chips, or veggies. Yes! 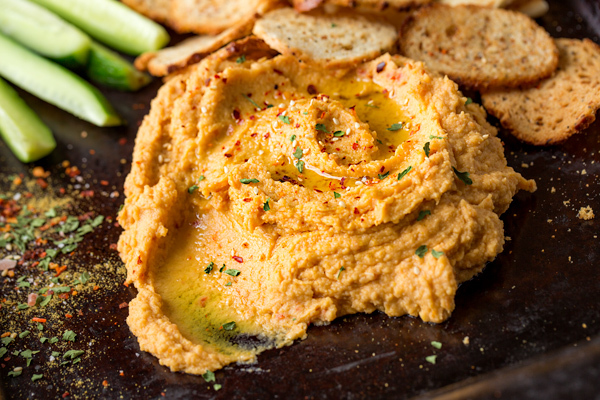 I love roasted garlic hummus… so delicious! I am a big fan of roasted garlic! Bet this hummus tastes extremely flavourful and tasty.